Picture - Photo of a Bomarc missile launch. The CIM-10 Bomarc was the only surface-to-air missile ever deployed by the United States Air Force. All other U.S. land-based SAMs were and are under the control of the United States Army. The supersonic Bomarc missiles were the first long-range anti-aircraft missiles in the world. They were capable of carrying conventional or nuclear warheads. Their intended role in defense was in an intrusion prevention perimeter. Bomarcs aligned on the eastern and western coasts of North America would theoretically launch and destroy enemy bombers before the bombers could drop their payloads on industrial regions. It involved the deployment of tactical stations armed with Bomarc missiles along the east and west coasts of North America and the central areas of the continent. BOMARC and the SAGE guidance system were phased out in the early 1970s since they seemed to be ineffective and costly. Neither of these systems was ever used in combat, so while their combat effectiveness remains untested, they are still perceived as having been an important deterrent. In addition to the USAF, the Bomarc was also deployed by Canada after the country had canceled its advanced Avro Canada CF-105 Arrow manned interceptor in 1959. In 1946, Boeing started to study surface-to-air guided missiles under the United States Army Air Forces project MX-606. By 1950, Boeing had launched more than 100 test rockets in various configurations, all under the designator XSAM-A-1 GAPA (Ground-to-Air Pilotless Aircraft). Because these tests were very promising, Boeing received a USAF contract in 1949 to develop a pilotless interceptor (a term then used by the USAF for air-defense guided missiles) under project MX-1599. 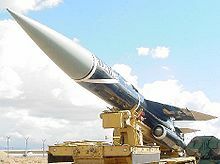 The MX-1599 missile was to be a ramjet-powered, nuclear-armed long-range surface-to-air missile to defend the Continental United States from high-flying bombers. The Michigan Aerospace Research Center (MARC) was added to the project soon afterward, and this gave the new missile its name Bomarc (for Boeing and MARC). In 1951, the USAF decided to emphasize its point of view that missiles were nothing else than pilotless aircraft by assigning aircraft designators to its missile projects, and anti-aircraft missiles received F-for-Fighter designations. The Bomarc became the F-99. The IM-99A had an operational radius of 200 miles (~320 km) and was designed to fly at Mach 2.5-2.8 at a cruising altitude of 60,000 feet (18.3 km). It was 46.6 ft (14.2 m) long and weighed 15,500 lb (7,020 kg). Its armament was either a 1,000 pound (455 kg) conventional warhead or a W40 nuclear warhead (7-10 kiloton yield). A liquid fuelled rocket engine boosted the Bomarc to Mach 2, when its Marquardt RJ43-MA-3 ramjet engines, fueled by 80-octane gasoline, would take over for the remainder of the flight. The operational IM-99A missiles were based horizontally in semi-hardened shelters ("coffins"). After the launch order, the shelter's roof would slide open, and the missile raised to the vertical. After the missile was supplied with fuel for the booster rocket, it would be launched by the Aerojet General LR59-AJ-13 booster. After supersonic speed was reached, the Marquardt RJ43-MA-3 ramjets would ignite and propel the missile to its cruise speed and altitude of Mach 2.8 at 20000 m (65000 ft). Picture - Bomarc missile site. When the Bomarc was within 16 km (10 miles) of the target, its own Westinghouse AN/DPN-34 radar guided the missile to the interception point. The maximum range of the IM-99A was 400 km (250 miles), and it was fitted with either a conventional high-explosive or a 10 kt W-40 nuclear fission warhead. The Bomarc relied on the Semi Automatic Ground Environment (SAGE), an automated control system used by NORAD for detecting, tracking and intercepting enemy bomber aircraft. 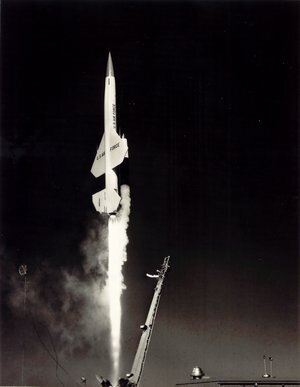 SAGE allowed for remote launching of the Bomarc missiles, which were housed in a constant combat-ready basis in individual launch shelters in remote areas. At the height of the program, there were 14 Bomarc sites located in the United States and two in Canada. The liquid-fuel booster of the Bomarc A was no optimal solution. It took two minutes to fuel before launch, which can be a long time in high-speed intercepts, and its hypergolic fuels were very dangerous to handle, leading to several serious accidents. As soon as high-thrust solid-fuel rockets became a reality in the mid-1950s, the USAF began to develop a new solid-fueled Bomarc variant, the IM-99B Bomarc B. It used a Thiokol XM51 booster, and also had improved Marquardt RJ43-MA-7 (and finally the RJ43-MA-11) ramjets. The first IM-99B was launched in May 1959, but problems with the new propulsion system delayed the first fully successful flight until July 1960, when a supersonic KD2U-1/MQM-15A Regulus II drone was intercepted. Because the new booster took up less space in the missile, more ramjet fuel could be carried, increasing the range to 710 km (440 miles). The terminal homing system was also improved, using the world's first pulse doppler search radar, the Westinghouse AN/DPN-53. All Bomarc Bs were equipped with the W-40 nuclear warhead. In June 1961, the first IM-99B squadron became operational, and Bomarc B quickly replaced most Bomarc A missiles. In September 1958 Air Research & Development Command decided to transfer the Bomarc program from its testing at Cape Canaveral Air Force Station to a new facility on Santa Rosa Island, immediately south of Eglin AFB Hurlburt Field on the Gulf of Mexico. To operate the facility and to provide training and operational evaluation in the missile program, Air Defense Command established the 4751st Air Defense Wing (Missile) (4751st ADW) on 15 January 1958. The first launch from Santa Rosa took place on 15 January 1959. The first USAF operational Bomarc squadron was the 46th Air Defense Missile Squadron (ADMS), organized on 1 January 1959 and activated on 25 March. The 46th ADMS was assigned to the New York Air Defense Sector at McGuire AFB, New Jersey. The training program, under the 4751st ADW used technicians acting as instructors and was established for a four month duration. Training included missile maintenance; SAGE operations and launch procedures, including the launch of an unarmed missile at Eglin. In September 1959 the squadron assembled at their permanent station, the Bomarc site near McGuire AFB, and trained for operational readiness. The first Bomarc-A went operational at McGuire on 19 September 1959 with Kincheloe AFB getting the first operational IM-99Bs. While several of the squadrons replicated earlier fighter interceptor unit numbers, they were all new organizations with no previous historical counterpart. 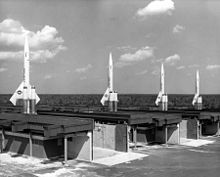 ADC's initial plans called for some 52 Bomarc sites around the United States with 120 missiles each but as defense budgets decreased during the 1950s the number of sites dropped substantially. Ongoing development and reliability problems didn't help; nor did Congressional debate over the missile's usefulness and necessity. In June 1959, the Air Force authorized 16 Bomarc sites with 56 missiles each; the initial five would get the IM-99A with the remainder getting the IM-99B. However, in March 1960, HQ USAF cut deployment to eight sites in the US and two in Canada. 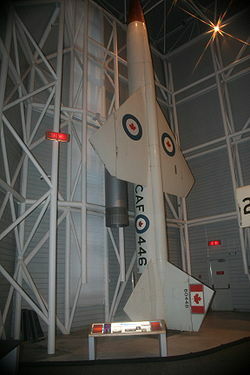 The Bomarc Missile Program was highly controversial in Canada. The Progressive Conservative government of Prime Minister John Diefenbaker initially agreed to deploy the missiles, and shortly thereafter controversially scrapped the Avro Arrow, a supersonic manned interceptor aircraft, arguing that the missile program made the Arrow unnecessary. Initially, it was unclear whether the missiles would be equipped with nuclear warheads. By 1960 it became known that the missiles were to have a nuclear payload, and a debate ensued about whether Canada should accept nuclear weapons. Ultimately, the Diefenbaker government decided that the Bomarcs should be equipped with conventional warheads. The dispute split the Diefenbaker Cabinet, and led to the collapse of the government in 1963. The Opposition Liberal Party argued in favour of accepting nuclear warheads and, after winning the 1963 election, the new Liberal government of Lester Pearson proceeded to accept nuclear-armed Bomarcs, with the first being deployed on 31 December 1963. Pierre Trudeau, still working as a journalist, attacked Pearson for the decision. While he was forced to reverse himself when he decided to run as a candidate for the Liberals in the 1965 election, he remained unenthusiastic. Shortly after becoming prime minister in 1968, he announced that the missiles would be phased out by 1971. Within a year of becoming operational, a Bomarc-A with a nuclear warhead caught fire at McGuire AFB on 7 June 1960 following the explosive rupture of its onboard helium tank. While the missile's explosives didn't detonate the heat melted the warhead, releasing plutonium which the fire crews then spread around. The Air Force and the Atomic Energy Commission cleaned up the site and covered it with concrete; fortunately, this was the only major incident involving the weapons system. The site remained in operation for several years following the fire, but after its closure in 1972, the accident resulted in that area remaining off limits to the present day, primarily due to low levels of plutonium contamination. In 1962 the Air Force started using modified A-models as drones; following the October 1962 tri-service redesignation of aircraft and weapons systems they became CQM-10As. Otherwise the air defense missile squadrons maintained alert while making regular trips to Santa Rosa Island for training and firing practice. After the inactivation of the 4751st ADW(M) on 1 July 1962 and transfer of Hurlburt to Tactical Air Command for air commando operations the 4751st Air Defense Squadron (Missile) remained at Hurlburt and Santa Rosa Island for training purposes. In 1964, the liquid-fueled Bomarc-A sites and squadrons began to be inactivated. The sites at Dow and Suffolk County closed first. The remainder soldiered on for several more years while the government started dismantling the air defense missile network. Niagara Falls was the first BOMARC B installation to close, in December 1969; the others remained on alert through 1972. In April 1972, the last Bomarc B in USAF service was retired at McGuire and the 46th ADMS inactivated. Picture - A CQM-10B drone launched at Vandenberg Air Force Base, 1977. The Bomarc, designed to intercept relatively slow manned bombers, had become a useless asset in the era of the intercontinental ballistic missile. The remaining Bomarc missiles were used by all armed services as high-speed target drones for tests of other air-defense missiles. The Bomarc A and Bomarc B targets were designated as CQM-10A and CQM-10B, respectively. Notably, due to the accident the McGuire complex has never been sold or converted to other uses and remains in Air Force ownership, making it the most intact site of the eight in the United States. It has been nominated to the National Register of Historic Sites. Although a number of IM-99/CIM-10 Bomarcs have been placed on public display, concerns about the possible environmental hazards of the thoriated magnesium structure of the airframe have resulted in several being removed from public view. Russ Sneddon, director of the USAF Armament Museum, Eglin AFB, Florida provided information about missing CIM-10 exhibit airframe serial 59-2016, one of the museum's original artifacts from its founding in 1975 and donated by the 4751st Air Defense Squadron at Hurlburt Field, Eglin Auxiliary Field 9, Eglin AFB. As of December 2006, the suspect missile was still stored in a secure compound behind the Armaments Museum. Picture - Bomarc B on display at the Canada Aviation Museum Ottawa, Ontario, Canada, c. 2006. Vandenberg Air Force Base (Space and Missile Heritage Center), California. Bomarc not for public access. Clearwater, John. Canadian Nuclear Weapons. Toronto: Dundern Press, 1999. ISBN 1-55002-299-7. Gibson, James N. Nuclear Weapons of the United States: An Illustrated History . Atglen, Pennsylvania: Schiffer Publishing Ltd., 1996, ISBN 0-7643-0063-6. Nicks, Don, John Bradley and Chris Charland. A History of the Air Defence of Canada 1948-1997. Ottawa: Commander Fighter Group, 1997. ISBN 0-9681973-0-2.